Great post! If I could go in the wardrobe and come out transformed, it would be in terms of gaining why feels like hidden information about what career I want to follow. Gone would be what feels like the inevitable judgment of others: “You’re almost 40 – pick something!” Or “You mean you still haven’t figured that out? The rest of us get that sorted out in our early 20s.” I suppose the real issue is, one has to work at something, and people out of kindness always ask, “So what do you want to do?” I’d give a lot to never have that conversation again. In a way, I feel like what I want to do is no one’s business but mine. And that I shouldn’t have to choose a career just because someone else has. There always seems a discrepancy towards how I feel about something and “reality”, lol. Thanks for listening. I would jump into that magic wardrobe and come out changed in the most peaceful way…I’d be an observer (and not have to talk incessantly), an enjoyer (a smile on my face, embracing the sights, sounds and smells), a quiet, gentle supporter (no need for verbose lessons), I’d be nicer than I feel inside (and everyone would marvel at my kindness), I’d get my sparkle back (and everyone could see it –even me), and I’d magically make the right decisions, life would be easy, and days would slow down so that I could just relax into them and embrace what each day may bring…. I would come out with more courage and a softer heart. What would I be when I came out? I love these comments! I’ve been reading Kindnessgirl’s blogs for a while now, and reading your comments, but now I’ve ventured out to chat with all of you! I’d love to be reading *The Lion, the Witch, and the Wardrobe* (or, for me, even better, *The Lord of the Rings* or *His Dark Materials*) with Patience, but not just reading it– reading it for the first time again! You know? When you didn’t know what was just around the bend, and that new world of wonder was just opening up, and you knew in your bones that you’d live there, from time to time, the rest of your life, but it as yet was unexplored and tears had not yet been shed on the journey. And, to that extent, it’s that place of innocence that it sounds as though we’re all seeking again, where we can have our sparkle back (ohhhh, me, too, Brenda!) and decisions are suddenly easy again, and the days are slower so that we *can* sparkle and think about things long enough actually to make authentic choices and decisions rather than just rush along, letting expediency make the choices for us. I am so very much with you on THAT. And, I’d add, with Jet and Kimberley, with bravery, we pray. Courage. And a soft heart. So that, as Jeri said, maybe one day I can find myself again. Where did she go, that laughing girl who really did believe that ANYthing is possible? I miss her spirit more than anything in the world. This cynical thing that passes for “practical” I don’t recognize any more. I don’t know where that hopeful laughing girl went, but like you, IHeartVegetables, more than anything I need the cool darkness of the wardrobe to rest for a while, to dream and sleep and dream again, so that maybe one day, when I wake, I’ll wake to my own singing. 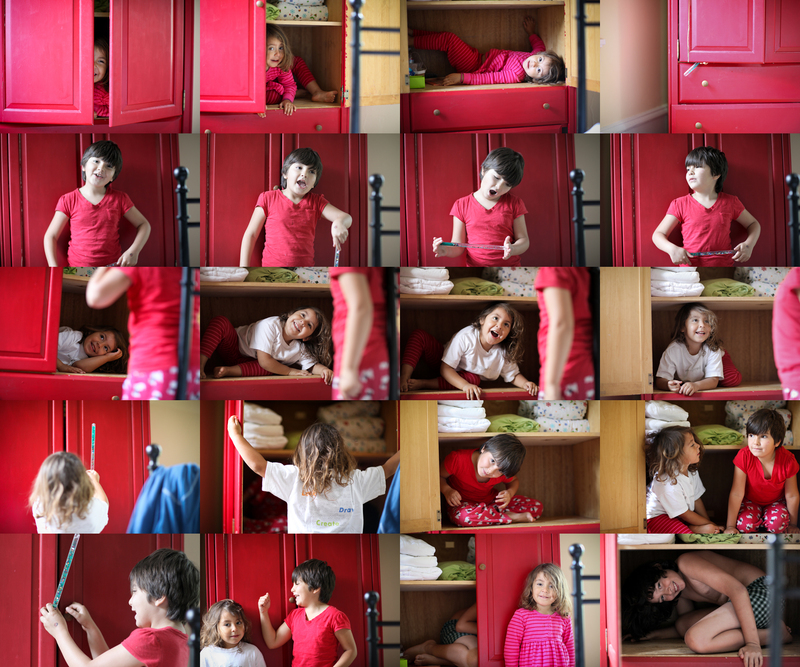 So, Patience, what is the difference between an armoire and a wardrobe? I just thought that they mean the same things, but “Armoire” just sounds all Frenchy and formal, while “wardrobe” is down-home English like our favorite authors and the best of Harry Potter. In any case, I *want* a wardrobe! Erin, Bella Bleue– I don’t want to leave you out, since I addressed everybody else who had posted! You left your comment while I was composing (and then going out to an appointment, and on and on). Yeah, well, I’m old enough to remember the original Mickey Mouse Clubhouse, with Annette and Frankie and all the little kids. I wish I didn’t feel sad when I look back on all that, knowing now what we know happened to Annette, for example. I am working on dwelling in the happy memory and in this happy moment, remembering. But it’s hard. I love that I found you all. It makes the world less scary when you know there are others that feel the same thing as you. I know that is cliche, but how many groups do you know out there that are for women that just want to get their spark back, slow time down, enjoy their family? This may be Patience’s blog, but I consider it my “Help me feel good” group. Love, Love, Love this Patience’s blogger group! I SO agree…you all make this space so rich and real…thank you for taking time to share with me and for being in this thing together. So much love to you all!